Here in Seattle, pecan pie sightings of any variety are few and far between. Which is probably just as well seeing as restauranteurs here would likely substitute walnuts and toss in some rosemary or cumin for a creative twist. I have had a couple of decent renditions featuring chocolate and/or bourbon, but nothing comes close to the sticky indulgence I grew up with. 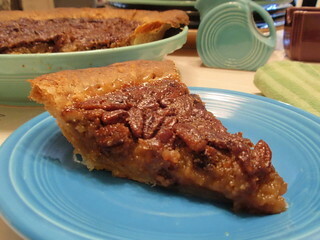 Also, I’d steer clear of any pecan pie that calls to mind the word “revamped.” It’s vamped enough! Don’t mess with perfection. 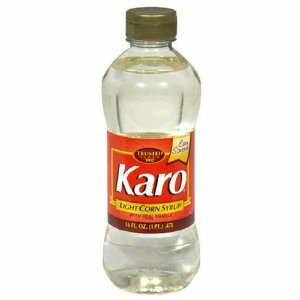 Folks might argue with me, but I think the secret to perfect pecan pie is corn syrup, or Karo as we say in the South. Does another brand exist? If so, I’ve never noticed. Having not made a pecan pie in years, I’m not sure which side to take in the light vs. dark debate. Anybody care to weigh in? When it comes to pecans, you’ll want to use the best you can find, seeing as they’re the star. I’m kicking myself that I didn’t buy a 10 pound bag from the roadside stand I encountered off I-95 in Georgia. But seeing as I had no room in my luggage or freezer at home, it’s just as well. Not really, but still. If you already know how to make perfect pie crust, skip ahead to the next paragraph. Ok, now that it’s just us, I’ll admit that I’m still struggling with this fickle beast and have been known to use those Pillsbury ones next to the heat-up cookies. This will do in a pinch. Just don’t resort to the frozen kind in the tin; they are inedible. Also, while a graham cracker crust IS mighty easy, it will never work for a pecan pie. Probably. The first time I made a pecan pie, I was amazed to discover that you can mix the nuts in with the sticky goo and they’ll rise to the top. Note: This is probably not the method Martha Stewart prefers. And for the love of all that is tasty, leave those pecans whole (or, technically, half). Save the pieces for brownies, cookies, banana bread, whatnot. Folks in the Holloway family are devout dessert eaters, which is why my nephew Ben has been permanently barred from carrying sweets to the table. He’s 20-something now and could most likely be trusted, but no. In the beginning, there was carrot cake. “Was” being the operative word. 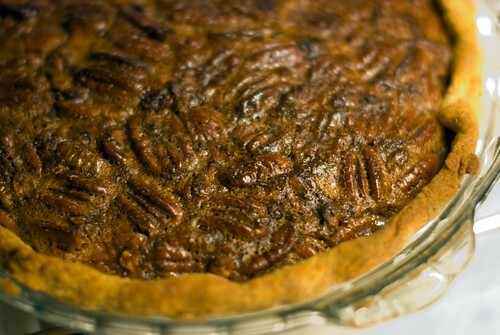 How does that story relate to pecan pie? Well, cut to Thanksgiving dinner at Mike and Kay’s with a bunch of no longer hungry but still-wanting-something-sweet Holloways. (That’s generally how we roll). Once again, someone allowed Ben to carry in dessert. Only this time, he decided to put the pecan pie on his head. On. His. HEAD. Well, you don’t need me to tell you what happened. And, yes, we ate that off the floor, too. BUT, we finally learned our lesson. I’ll leave y’all with another family recipe that’s characteristically short and exceptionally sweet. Remember, handle with care. Mix ingredients. Bake in pie crust at 325 for 50 minutes. What’s your secret to perfect pie crust? And have you ever eaten dessert off the floor? 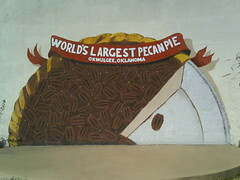 Photo credits from Flickr Creative Commons: Pecan pie by ldrose, World’s Largest by kb35, and Texas pecan pie by texascooking. storyteller. reader. expat southerner. recovering poet. also, i bake. I daresay there’s no place in the country–perhaps even the planet–where folks eat more salad per capita than the South. Now before y’all start to challenge my completely made up statistics, let me explain: When I say “salad,” I don’t mean a bowl of veggies lightly drizzled with dressing, perhaps topped with a sprinkling of walnuts or cranberries. Oh no. I’m referring to Southern-style salad, which hardly ever features any vegetable as the main ingredient. If you happen to be in the South and happen to be offered a slice of caramel cake (or better yet, somebody’s grandmother’s caramel cake), proceed with caution. Much like heroin, one hit’s too many and a thousand is never enough. 32. Walmart: Save Money. Live Better? To Southerners, Walmart isn’t just a place to score “everyday low prices” on toilet paper, big screen tvs, or whatnot. Oh no. It’s where folks go to socialize. You never know who might turn up at the local Walmart on a Sunday evening. And if you’re not there to take part in the gossip, well, one guess who the gossiping’s going to be about.